You are probably looking to start growing your own indoor plants. You’re looking for a reasonably priced option and you’ve stumbled upon the Roleadro GalaxyHydro 1000W LED grow light review. We will tell you in this review why this is a popular choice among starting growers and give you all the pros and cons on this light. 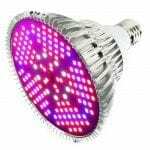 We will cover all the vital imperative characteristics that you should look at when buying your LED grow light. So, you can start growing cannabis with the best LED grow light for your budget. Check out our in-depth review of the Roleadro GalaxyHydro 1000W below. If your growing options encompass around a variety of plants, the Roleadro GalaxyHydro 1000W full spectrum grow light could be a great choice. This light can be used for a variety of plants because of its 9 band full-spectrum light. These 9 bands of the light spectrum (including red, white, blue, UV, and IR) cover 430 to 730 nanometers. This ensures the flourishing of any kind of plant in all of its growing processes. Whether you grow cannabis, herbs or vegetables. This light does the job. The downside of this light is that you cannot change or optimize the light spectrum, as it is non-customizable. This is not rare for a light in this price range. If you are looking for a light with customizable light-spectrum, you have to look for lights in a higher price range. Research in hydroculture tells that the red and blue parts of the electromagnetic spectrum play a pivotal role in indoor hydroponics. This happens by providing a substantial amount of Photosynthetic Active Radiations (PAR). To cater to this challenge, the Roleadro GalaxyHydro 1000W LED light boasts an impressive 9:1 ratio of the red and blue spectrum. This makes the plants vividly green and healthy. Something we experienced in our own testing while growing. In addition, this LED Grow Light claims to have 30% to 50% more red light than their counterparts to enable better results. I am not sure whether the results are that much better than competitive lights, but it still does a good job in growing your cannabis. The Roleadro GalaxyHydro 1000W LED is equipped with the right amount of ultraviolet (UV) and infrared radiations (IR). The UV radiations aid to the defense mechanism of plants by preventing the formation of harmful bacteria in them; hence, keeping their health intact. This is something that really comes in handy when building the resistance of your plants. 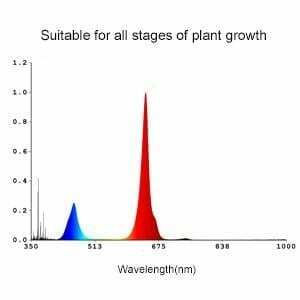 Besides, the presence of IR noticeably encourages the photosynthesis process in plants. Making them happier and healthier throughout the growing process. 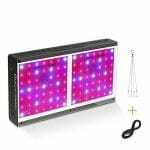 This 1000W LED grow light features the use of Zener diodes in them. This Zener design makes sure that in case of failure of a LED, the other LEDs are not affected. This LED grow light also exhibits the 90 degrees and 120 degrees angles of the optical lens, together with 3w EpiLED chips. The two of them combine to elevate the PAR value acquired by the plants (453umol at 18”) and improve the efficiency of light absorbed by the plants up to 98. The maximum utilization of light would allow a very short growth period of plants; consequently, letting you save a significant amount of energy. So, because of the LEDs, the Roleadro GalaxyHydro 1000W is a great energy saver compared to, for instance, T5 lights. To meet the objective of an effective and efficient heat removal process, The Roleadro GalaxyHydro LED 1000w grow light features two ETL-approved high-speed cooling fans. Moreover, its built-in aluminum heat sink and temperature controllers relay heat from the unit to the outside in a matter of 20 hours. On top of it, the aluminum substrate prevents the direct contact of the LEDs to the circuit; therefore, stretching their longevity up to 50,000 hours. This is comparable to other lights in its price range. 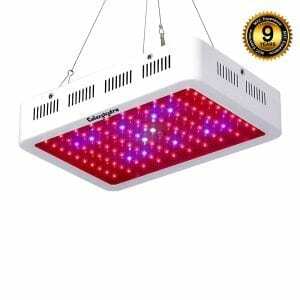 Making it a decent light for the price and competitive with comparable LED grow lights. It does, however, beat all of its non-LED grow light competitors. LED lights are better in dissipating heat and consuming less energy than all other types of lights. 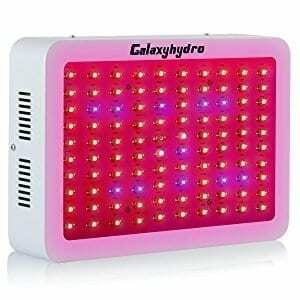 For those who are just stepping into the doors of indoor gardening and don’t want to take any risk of breaking your banks; the Roleadro GalaxyHydro LED 1000W grow light is one of the best lights for indoor growing. This light is a good value for money option and it has plenty of nice capabilities. Are you just starting to grow plants? Then this is a light worth considering. It is low on power consumption, has good heat dissipation and provides a full spectrum for all growing phases. However, if your intention is expanding the area of indoor gardening or if you wish to manipulate the spectrum for your plants, there are better options available. 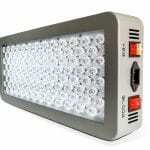 These options will, however, be a bit more expensive than this Roleadro GalaxyHydro LED 1000w grow light. 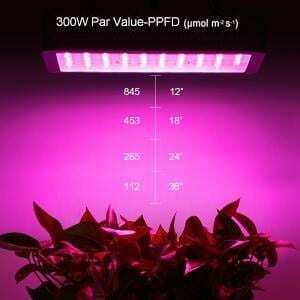 Value for money is what you get with this grow light. Are you interested in reviews of higher quality LED lights? Then you should maybe check out this review of the Kind LED K5 XL1000.